Despite the highly ornate interior of the Laxmi Vilas Palace the electrical fittings look pretty dodgy. Did you try to see if they worked? 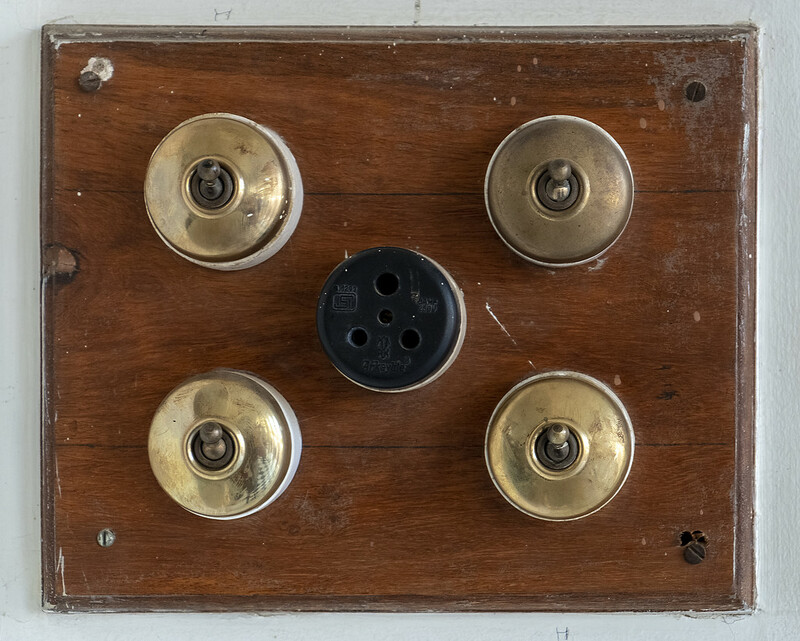 Nice old switches. I hope the wiring isn't as old though. Funny- they were probably much more polished and clean when they were first installed. Good shot. @gigiflower Yeah, that's why my hair stands on end. More seriously, no way. @robz Very, not sure if they're still in active use. @onewing Just what I thought to myself, said Pooh. They may not be in use at all, of course. I wasn't about to check. @olivetreeann I'll bet. This was the Rajah's Hunting Lodge so would have been umpteen servants scurrying about.